Post-workout nutrition will never be the same again. Protein shakes are a thing of the past. 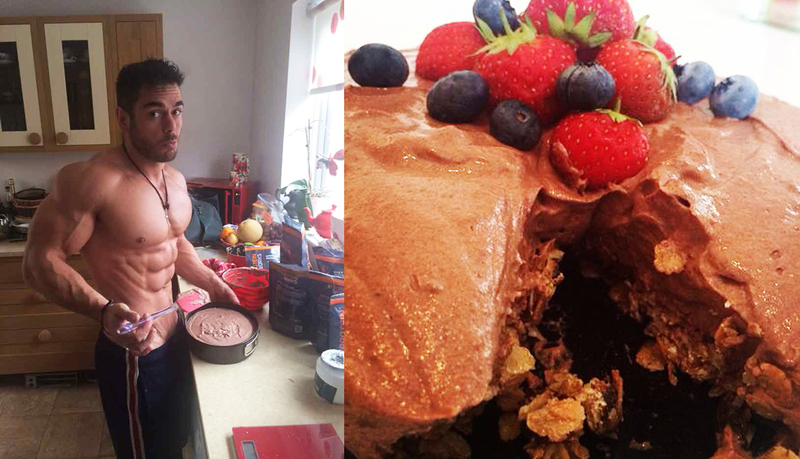 Presenting the, “Chocolate Protein Cheesecake” a nutrient dense recipe that helps you meet your elevated macro requirements (protein and carbohydrates) and enhance recovery after the gym. 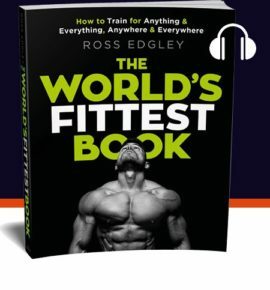 Plus, it’s been loaded with smaller superfoods and ‘functional’ ingredients that each boasts some pretty impressive research in sports nutrition. But before we get to the science and cooking, let me ‘wet your appetite’ with a little description of this latest creation to leave the kitchen. Firstly, the thick and creamy protein topping is made from a whey protein, natural yoghurt, quark, egg white and gelatine combination that essentially provides a varied protein and amino profile to the muscles to help which effectively capitalises on your increased protein synthesis post-workout (study). Then the base is made from a ‘biscuit-like’ museli, honey and berry mixture that provides a tapered release of carbohydrates each loaded with vitamins, minerals and phytonutrients that serves to both replenish muscle glycogen, spike insulin and essentially kick-start the recovery process. So, first and foremost you’ll see the cheesecake has been purposely created in a 3:1 carbohydrate to protein ratio. Whilst studies aren’t yet conclusive as to the exact ratio needed for optimal muscle recovery (and this can of course vary greatly depending on insulin sensitivity, the type of nutritional protocol adopted and many other factors) the beauty of this recipe is it can be altered to your exact specifications and own biology. So looking at the often quoted nutritional bible, “Nutrient Timing: The Future of Sports Nutrition” (by John Ivy and Robert Portman) it doesn’t matter if you want to adopt a 2:1 or 5:1 ratio, it can easily be adapted with a smaller or bigger cheesecake topping. Secondly, the biscuit-like base of the cheesecake has also been scientifically formulated too. To quote research published in the Journal of Sports Sciences, “Emphasis has been placed upon eating the optimal amount and best type of carbohydrate at the proper times” (Edward F. Coyle, 2001). Essentially this shows that the quality of the carbohydrates you eat, not just the quantity, can have a profound effect on your training. For this reason I decided to forgo the usual dextrose and maltodextrin post workout and instead opted for a nutrient dense base made from berries and muesli. Rich in vitamins, minerals and smaller phytonutrients, these are the smaller micronutrients that are often overlooked when training but those that can have a positive impact on our immune system, fat loss and many other benefits. Lastly, the secret weapon in this entire recipe is cocoa. That’s because scientists from the Department of Internal Medicine and Public Health at the University of L’Aquila in Italy found it can dramatically improve both blood pressure and insulin sensitivity (how our body processes carbohydrates). 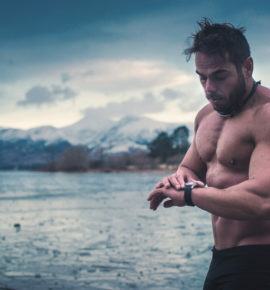 This is so important post workout since ultimately improving your insulin sensitivity in turn improves your body’s ability to absorb every single ingredient in your post workout nutrition. • M.J Gibala (2000) “Nutritional supplementation and resistance exercise: what is the evidence for enhanced skeletal muscle hypertrophy.” Canadian Journal of Applied Physiology, 25(6), 524-535. • Howarth, K. R., N. A. Moreau, S. M. Phillips, and M. J. Gibala. “Coingestion of Protein with Carbohydrate during Recovery from Endurance Exercise Stimulates Skeletal Muscle Protein Synthesis in Humans.” Journal of Applied Physiology 106.4 (2009): 1394-402. • Ivy, John, and Robert Portman (2004) “Nutrient Timing: The Future of Sports Nutrition.” Laguna Beach, CA: Basic Health Publications, 2004. • Levenhagen, Deanna (2001) “Postexercise Nutrient Intake Timing in Humans Is Critical to Recovery of Leg Glucose and Protein Homeostasis.” American Journal of Physiology (2001).